Now you can obtain the most rounded and uniform high-quality smooth, shiny, and even finish to the edges of your coin rings by quickly getting rid of those unsightly, uneven, flat edges with this new tool. This is the original mandrel set put out by myself that has been tested, tried and true! No more having to use nail buffing files, sanding by hand, using steel round files or de-burring tools to finish your rough coin ring edges... nothing else performs better in completing this critical aspect of coin ring-making! * You can also use this tool to both hold and sand off the "Coin Ring Lips"; or the lip that's underneath the reeded side of the coin (if you choose to) for a more uniform look. The abrasion-resistant rubber mandrels also naturally protects the coins' detail from damage while you're working it, so there's no need to use a screw to hold the coin in place, which could cause damage to the coins' surface... it's like having multiple tools-in-one! Now you can remove the extra time it takes to switch over the steel arbor whenever you have to go to another size mandrel cone! Simply add either ONE EXTRA arbor from the drop down list, or add TWO EXTRA Arbors from the drop down list to your kit! "I can't believe I lived without these for so long. Many uses beside finishing rings. Thanks Martin." "So you know how you make a cool coin ring then spend maybe an hour or so sanding it? (Depending on how high of a grade you want to go of course..) this awesome coin finishing kit whittles that time down to like 5-10 minutes. Simply amazing. Thanks again Martin for some BA tools!" "Nice set to give that finished look to your rings." "Martin is fantastic with customer service before, during, and after the sale. I received this Finishing & Polishing mandrel set and I can't say enough good things about them. It has taken my work to a professional level and I don't know how I did without them. Thanks." --- Ray S.
"This is the best thing I have purchased in coin ring making. Thank you for such an amazing product!" --- Larry M.
"This fills a niche not previously addressed, and is almost a necessity to produce a quality ring!" 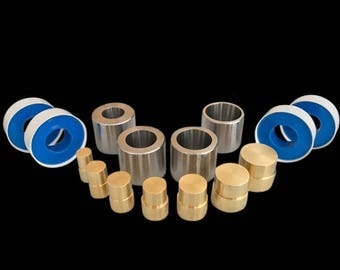 --- Dale C.
This unique set of different-sized Finishing and Polishing Mandrels are designed to give your coin rings that professional-looking quality finish on the otherwise rough flat edge that was originally the inner part of the coin that is so hard to achieve and will finish and polish any coin ring from an approximate US size of 5, up to an approximate US size of 14. Large --- (fits ring sizes of approx. 11-14). To change from one size to another, you simply hold the tapered rubber mandrel with one hand and twist the stainless steel shank with the other.... no tools are necessary! The advantage to using the finishing and polishing mandrels is that as the ring is held on tightly to the tapered mandrel that's spinning while being attached to your power drill; it acts much like a small lathe, providing a much more uniform finish to the ring than can be achieved with either hand-sanding, using a nail buffing file, a steel round-file, or even a small rotary tool such as a Dremel. 4.) Begin on the outer edge of the coin ring with the coarser 200 Grit sandpaper and work your way around to the inner edge of the coin ring; making sure that ONLY the corner tip of the sandpaper is making contact with the unfinished inner, top, and outer edges of your coin ring to prevent damage to the rings' detail. Take your time with this step; especially when you're first starting out. 5.) Continue to work the inner, top, and outer edges of the whichever side using the finer grits of sandpaper as you go; finishing with “0000” Steel Wool. You can also use the steel wool and LIGHTLY go over the inner and the outer detail of the coin ring before you either polish it with a jeweler's cloth or after you’ve put a patina (antique-looking) finish on the ring. Your ring will now have a highly-smoothed, rounded, and polished edge on either the REEDED or the NON-REEDED side that is not often seen on coin rings! (See the 3rd and the 5th listing photo for two examples of finished and polished coin rings using this technique). OTHER MATERIALS NEEDED: a power drill, 3 different grits of sandpaper (I use 200 Grit, 500 Grit, and 1000 Grit sandpaper), some “0000” Steel Wool, and a jeweler’s polishing cloth to complete this process. Those items can be purchased from Amazon.com; at a big box store like Home Depot, or any local hardware store inexpensively. *** Make sure that your power drill can accept a 1/4" size shank in order to be able to use this tool. 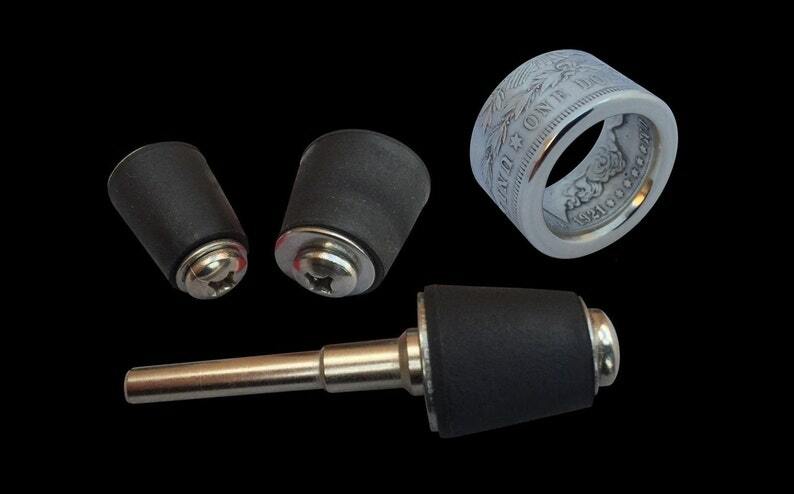 These are a great way to polish rings with the corded or cordless drill. You can polish the scratches and sanding marks from the edges or if you want to make a fully smoothed out ring. There’s a utube vid on it. They are quality made. Transaction was smooth and delivery was quick. This is my second set simply because now I can have the cones set up for different sizes rings. Sometimes I have to reverse the rubber cones to fit tighter so now I already have it set up. Not that it’s difficult to do, it’s just a little time consuming.